CRT is approved as the competent authority by the DFT of the UK and Eire for the testing of refrigeration appliances to ATP standard (Agreement Transports Périssables). Refrigeration capacity is usually carried out on units that are to be produced serially and the type approval is valid for six years. Refrigeration capacity in the test is measured at 30°C ambient and at three of four possible temperatures –20°C, -10°C, 0°C and +12°C. A type approved refrigeration unit can be fitted to any type approved insulated body and certified provided the refrigerating overcapacity is at least 1.75. 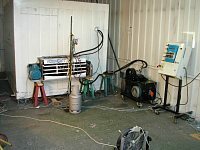 An option also exists to for a combined test on the body with the refrigeration unit fitted in which case the required overcapacity is 1.35. Three calorimeters units are available for the refrigeration capacity service in our environmental chambers, as described under the section concerning calorimeters on the environmental testing page. See the guide to ATP for more information and pricing or for precise details the ATP agreement.